I spent this past weekend in LA enjoying my very first admit weekend. For the most part, the event played out the way I expected, but there were definitely a few things that I stood out to me, which I’ll highlight in this post. If you’d like a detailed summary, feel free to go to this site for a full synopsis. 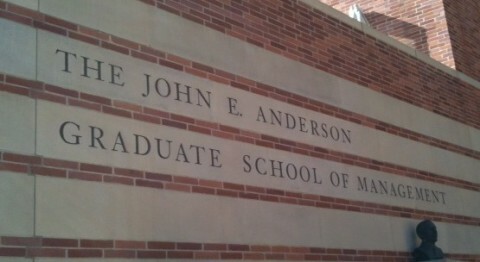 Anderson Days kicked off with In and Out Burger for lunch. Even though I live in California, I hadn’t dined at In and Out for a while, and had forgotten how great those burgers were. 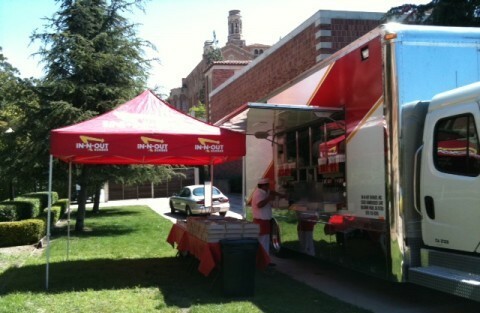 I’d also never seen an In and Out food truck before. Anyway, the burger was awesome and represented a great start to the weekend. As I began to learn more and more about the Anderson experience, the two things that stood out most obviously were the culture and the environment. In speaking with other admits who had attended weekends at east coast schools, they all commented about how the culture was different here. People were more laid back and colloquial. Every conversation didn’t feel like an elevator pitch. I honestly had expected a lot of people to still be discussing their GMATscores, GPAs, and which schools were ranked the best. But it seemed that most attendees had moved on from that phase. The majority of the people there had either already chosen Anderson as their destination or were very close to doing so. The weather also made a huge difference, as there’s no way the east coast schools can compete with the weather down in LA. There were a couple of admits who were planning to choose Anderson over Tuck and Chicago, with weather as a major factor. Now, they probably weren’t deciding based on weather alone, but it goes to show you that ranking definitely doesn’t mean everything to all people. I need to sharpen my story. Of the people I met, very few had already experienced a career switch. While I know people say that there’s nothing wrong with it, having a career switch of any sort makes it more difficult to tell your story. I personally didn’t choose to get laid off. But having that in my background has jumbled my value proposition and I don’t have an obvious direction going forward. This is definitely something I need to work on as I begin business school. I need to focus on my goals. Maybe I’m just being hard on myself, but I felt that I met quite a few people who knew they were going to Anderson and knew what they wanted to do. And while I didn’t talk much about school rankings, GMAT scores, GPAs, etc., I was still floating around with an “admissions” mindset. I realized that I need to begin focusing on the actual “point” of an MBA, which is to obtain the job and career of my dreams. I’m going to business school. Though I’ve known this for a while, I think admit weekend was the first time I recognized the gravity of my decision. I will be quitting my well-paid, full-time job. I won’t have a salary for two years. In just a few months, I’ll pack up all my belongings, move to a different city, and begin working tirelessly to change both my career and my life. Yikes. In terms of cost, I paid for most of my travel with the hotel and airline points I had accumulated from a strenuous consulting career. The benefit of doing this was that I got to stay at the W Los Angeles Westwood, a hotel I’d never lodge at on my own dime. The hotel definitely didn’t have a lot of business at the time, as I was automatically upgraded to a penthouse level room. It’s nice that, despite the fact I no longer have status, Starwood still shows me some love. After consulting for so many years, I’ve become somewhat of a hotel snob and it’s difficult for me to be impressed by a hotel. 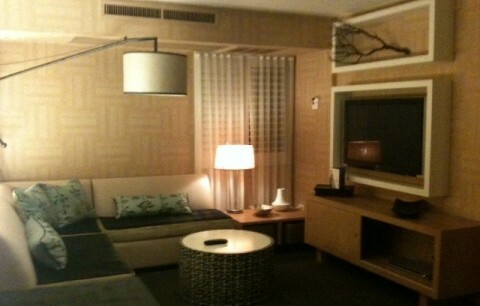 But the W Los Angeles was definitely one of the best I’ve ever stayed at. Overall, I had a great experience over the weekend and met a lot of people who will likely be my future peers. If Wharton pulls me off its waitlist, things will get interesting, but otherwise, I’ll be happily attending UCLA this fall.